Following are some baby shower centerpiece ideas you can use for outstanding parties. Use these resources for party decorations to create a special event for the mommy-to-be. The centerpiece generally sits on the buffet table or on the guest dining tables. You’ll want centerpieces that blend nicely with the overall theme and color scheme of your party. If you’ve done any research online looking for baby shower centerpiece ideas, you’ve surely come across diaper cakes. These inedible confections made of rolled diapers make wonderful baby shower decorations because they’re not only cute but they’re useful long after the party is over. A diaper cake is usually made from disposable diapers but they can be made from cloth diapers, too. They can be as simple as several tiers of rolled diapers stacked in the form of a cake and decorated with ribbon or they can be elegant and covered with baby items like booties, diaper covers, baby bottles, and personalized feeding utensils. There are two main styles of diaper cake centerpieces – rolled and smooth style. You can make your own to customize the theme to your party. You can also buy a diaper cake (you’ll find the best choices online) and then customize the rest of the theme around the diaper cake. Or follow this baby shower’s lead and go for a centerpiece of all pink candy in beautiful glass vases and jars. Isn’t that the most incredible display of pink you’ve ever seen? You’ll find lots of baby shower balloon decoration ideas online and at baby stores. Not only are there the standard Mylar baby shower balloons, but you can make incredible balloon decorations yourself with some simple projects. Start by making balloon rattles out of twisting balloons. These can either be strung around the party area or attached to the top of a diaper cake for pretty party centerpieces. Twisting balloons can also be wrapped around round, latex balloons and placed in planters for garden-style baby shower decorations that are bright and cheery. Use your imagination and come up with great color schemes that either match the baby’s nursery or the mother’s favorite colors. When decorating for a party, I like to fill the area with decorations from top to bottom but it gets so expensive. Even just a large fold out banner can cost $10-20. That’s what I love about this balloon rattle – it makes a pretty large decoration but it’s incredibly cheap to make. This photo caught my eye because of the sharp contrast of the bright, pink flowers with the dark green foliage. They’re beautifully displayed with twisted stems in glass vases and the base of each vase is offset with pale, blue-green tulle. But there are even more centerpiece ideas in this photo. There are small, baby-themed gift bags in between some of the vases in blue and green colors that match the tulle. They’re filled with tissue paper to add more color to the table. In my mind, there are two overall styles of showers – one is very baby themed with lots of baby items. The second uses decorations that are less baby themed and more geared towards the attending adults. This image reminds me of the second style. In addition, pretty white and pink flower party napkins are placed inside the large water goblets. This is a quick little kit where all you need to do is supply the diapers and rubber bands with which to hold them together and you can dress up a cute diaper cake of your own for your party table. I immediately thought you could make your own kit with a lot of those cute scrapbook papers you can get at the craft store. Just get one that has repeated baby pattern on the paper and then cut out the shapes and use them yourself for the cake. Add some ribbon and you’re done. You might want to glue the scrapbook paper to some card stock to make them sturdier. The one thing that always crosses my mind is what the new mother will do with all of those diapers after the shower. Each is individually wrapped with a rubber band. For her to store them, she’d have to remove all of those bands and come up with a container to hold them. If you have one of those gift popcorn tins hanging around, help her store the diapers inside after the party. She can pull off the rubber bands as she uses the diapers and the tight rolls will store perfectly in the rounded tin can. I can’t think of any celebration in which flowers won’t work so using flowers in baby shower centerpieces is always a way to go. Even simple, less expensive daisies – a happy flower, if ever I saw one – tied with ribbon that says “It’s a boy”, “It’s a girl”, or “Happy baby shower!” make festive centerpieces. Another way to use flowers in baby shower centerpieces is to mix them with balloons. Insert florist’s foam in children’s plastic sand pails. Stick the stems of some plastic daisies from a craft store into the florist’s foam. Tie a nice giant, pink, yellow or blue bow around the daisies. Then, inflate clear and pastel 5″ balloons, attach them to balloon sticks and insert the sticks into the foam so the balloons sit just under the daisies, making a colorful collar around the flowers. Use pacifier holders to attach blue and pink pacifiers to the center of the bows. There are also flowers that aren’t really flowers. They’re made from baby items like socks and onesies. How cute are these?! These hand made baby shower centerpieces are adorable. Using clay flower pots, paint and tissue paper you can make potted baby outfits and matching booties for your table decor. This video is 20 minutes long but is absolutely packed with the cutest ideas! She’s made little girl dress invitations; used toilet paper rolls in a unique way to anchor balloons (talk about cheap but effective! ); made a vase of simple, pretty pencils with charms and ribbon which could easily be a centerpiece; created these adorable, wrapped lollipop trays; and shows off a wonderful, handmade baby shower banner. Take a peak! When you need to keep it fast and simple, you can always use accordion style, tissue table centerpieces for a baby shower. There are lots of cute ideas and color options – certainly more than ever before! Baby dolls can be used as baby shower centerpieces – especially if the expecting mother is having a girl or if she already has any daughters. The baby dolls can then be used after the party as toys for the new baby or her siblings. Find cute baby dolls – and I’m not talking Barbie, I mean dolls that look like newborn babies. Find small. flexible baskets at your local craft store. Swaddle the baby doll in pretty receiving blankets, place a doll in each basket and tuck flowers in around the baby. You can even attach small bunches of 5″ helium balloons to the baskets. This works especially well if you’re having a baby shower for a mother expecting multiples. Have one baby doll for each baby on its way and place the baskets side by side. Deco bubble balloons are a decorating balloon that combines the shape of a round balloons with the long-lasting qualities of Mylar balloons. They’re clear or frosted in color and are meant for making stuffed balloon decorations. The clear sheen of the deco bubble balloon makes the balloons stuffed inside appear more lifelike and colorful. You can either stuff smaller round balloons inside a Deco balloon and use them as centerpieces or floating balloon decorations attached to centerpieces or you can find deco balloons made for baby showers. 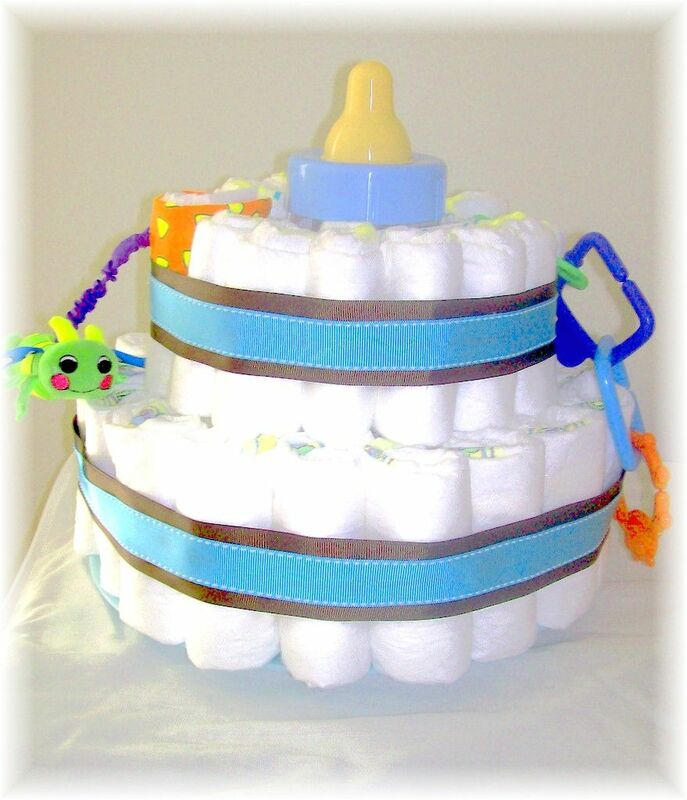 Smooth style diaper cakes are made in much the same fashion as rolled diaper cake centerpieces except that the tiers are formed by fanning the diapers around so they spiral out from the center. A large rubber band or simply the ribbon holds them in place. Make sure the rubber band is large enough that it doesn’t cause the diapers to be cinched in at the middle. The cake can then be covered with a baby item like a crib blanket, a receiving blanket, or baby towels to appear like the icing on the cake. Additional diapers are folded and wrapped around the tiers and then covered in ribbons and bows. The final touches are any additional baby items that you want to attach as gifts or decorations. Rolled diaper cakes for baby showers are made by literally rolling the diapers individually and securing each one with a rubber band. The diapers are stood on their ends to form a circle with a large rubber band around them to hold them in shape. Smaller and smaller layers are stacked on top to build the tiers of a diaper cake. Once the tiers are in place, beautiful ribbon covers the rubber bands. One alternative is to stack the diapers around an 8 oz baby bottle so that the second tier shows the top of the baby bottle as the top of the diaper cake. This video is FILLED with great ideas for baby shower centerpieces, games you can play, inexpensive decorations and gifts for attendees. While the decorations were all done in a ladybug theme, her ideas for where to get items to use for her homemade decorations would apply to any theme. Truly inspirational if you’re the least bit creative! Baby shower centerpiece ideas pop up everywhere once you open the door to using items creatively. Try something new and you’re sure to have loads of fun!